Last Friday, Mar. 25 (so far behind! ), I had the opportunity to visit with LDS illustrator and BYU professor Robert T. Barrett in his home. I asked if I could invite a friend, he agreed, so Katie (hi, Katie! ), who is also a great artist (don't deny it! You know you are!) was my Book Adventure companion for the day. In slushy snow, we pulled up to his big beautiful house, and were welcomed inside. Gospel artwork and portraits decorated the walls. We were shown into the parlor (? Entertaining room? You know, the place for guests that doesn't have a TV but instead has a piano in front of a large window and nice couches), sat opposite from Mr. Barrett, and proceeded to receive so much information that I have to tell you, I can't remember very much of it (I'm sure Katie remembers some. Katie! Make a comment with all that you remember please!). Even considering that fact, it was a great experience. Mr. Barrett is VERY knowledgeable about the arts and has artist connections to the moon and back (if you get that reference I will give you invisible Kudos). He told us about a New York trip he had just returned from with several illustration students and fellow illustrator and teacher, Bethanne Andersen. Apparently they all got to visit such greats as Brett Helquist (LDS), Kinuko Y. Craft, Paul O. Zelenski and ...who else? Others. And they visited them in their HOMES. I may or may not have turned slightly green (with envy, not sickness or St. Patty's Day residual) when he spoke of this. He also related many great, inspiring words from fellow artists as well as teaching principles of success. The idea that stood out to me was the concept of what is real versus what an artist actually produces. Reality can be either too dull or too detailed or just too common (or all of these things and many more). The task of an artist is to see it in a different way; a way that is intriguing, or that speaks to some purpose, draws a focus. At least this is the concept that came to my mind through some of the things he said. I came away with; take reality and add your style. What you get will be pretty cool (as you can see, I am in no way a scholarly type). He mentioned that at one point on another school trip, a movie special effects guy said that they make "hyper reality", reality to the next level. This is what an artist does (and a writer, I might add!). Robert Barrett also explained his process for creating such amazing pieces of artwork, whether for framed paintings or for book illustrations. He does a LOT of research, finds references (pictures, etc. ), and also uses models. Sometimes the models are people he knows, such as neighbors or family and sometimes he needs to hire people who look more the part that he is in need of. When working with models he sets up his parlor (the room in which we were sitting) with sheets, props, and proper lighting to get the correct structure and effect for his art. I just imagine how neat it would be to be painted for a picture book! But the process with the models can take a lot of time and effort (Robert has a very patient and supportive wife). Another cool aspect to setting up a model shoot is the costumes. Mr. Barrett has to find the right clothes for the models to wear so that he can accurately draw them, sometimes needing civil war outfits or Biblical attire. I want to know where he keeps all of this stuff (the props and costumes)! I didn't ask though, I can't remember why, but I bet his grand-kids could have a hay day with it all. 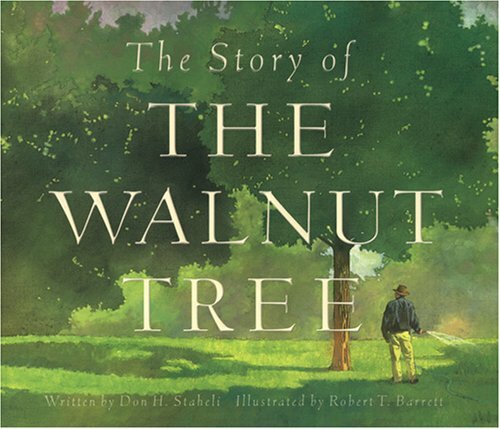 The book that I took with me to be signed was The Story of the Walnut Tree. It is sadly out of print (but I got mine through Amazon sellers!). It is the tale behind (historically, not physically) the podium located in the Conference Center of the Church of Jesus Christ of Latter-day Saints in Salt Lake City. The most recent books that Mr. Barrett has illustrated are about Barak and Michelle Obama. In addition to children's book illustrations, he has also done artwork for the Ensign magazine, figure drawing books, and beautiful gospel paintings. And yes, my name is misspelled again. He was talking on the phone with Bethanne Andersen at the time. What a beautiful interview! You and Katie are very lucky. :o) I love The Walnut Tree book, but I'll have to look into his others. Thanks for sharing this great summary of your visit with him. How fun that you got to interview him. My husband did Illustration at BYU so he had Brother Barrett for a lot of classes. He is such a nice guy. And, you know, a very talented artist.